My Life as Jane: Dude, there's a big dead bear outside your store. This is easily my most favorite thing I've read all day. I'm glad that I was able to offer you the inspiration with which to write it. EDIT: I had to edit the post to tell you that my word verification was geoBEAR. I'm not kidding. Insan. 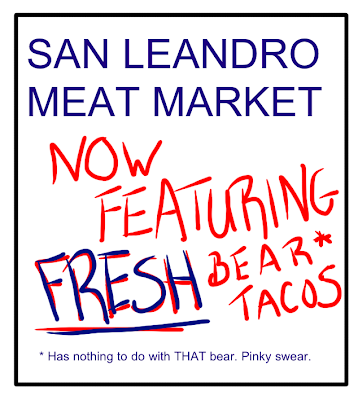 Bears Taco, I meant. Sh%$, are you seriouuuusssss??? I can't over that,..
Next thing ya know, you'll be saying there are farms in Berkley. Clearly a gang-related crime; "da Bears" gang was trying to muscle in on "da Cougar" gang for control of the neighborhood. Typical urban blight, nothing to see here, folks, keep moving. Cops just shot a cougar in our town. I'm telling you if we don't get jobs for these animals they'll just take over our neighborhoods. Haha I loved the bear roll call you imagined! So clever! Great post! Love the pinky swear! 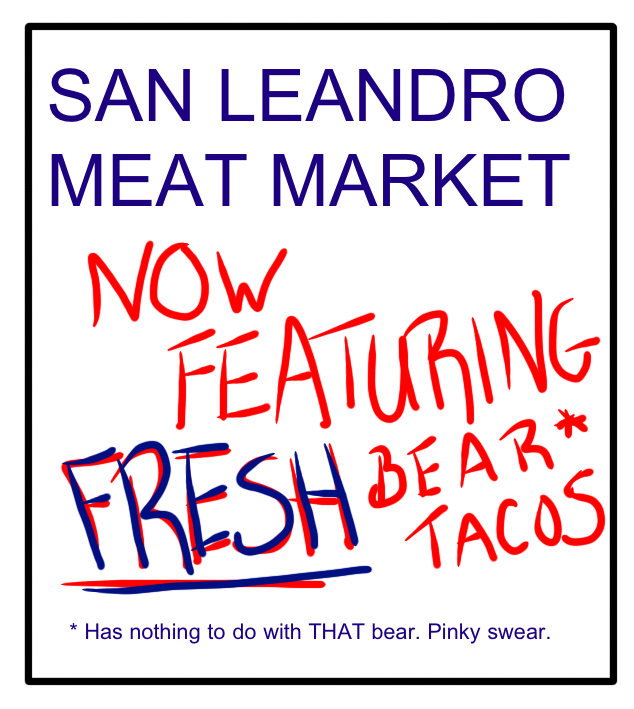 I can't believe I didn't hear about this before, living pretty close to San Leandro. I'm glad, though, since your posts are so much more entertaining that any media coverage. BAHAHAHA, thanks for the laugh!!! Seriously though, this is very bizarre. How does one go about dumping a 300 pound bear anywhere? My mother once made a pie crust with the lard of a black bear, it was not tasty. Big damn laughs. Made me LOL about four or five times here. Thank you! Where oh where is Jane?? ?